Prominent & Leading Manufacturer from New Delhi, we offer dry destoner, destoner, gram destoner and paddy destoner. 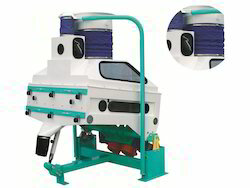 Dry Destoner mainly finds application in the seed handling industries wherein same size stones have to be removed from seeds before processing. The most efficient vibratory motion using a pair of high performance unbalance weight vibro-motors. Working deck rests on resilient springs and is carefully designed to ensure kinetic stability. The vacuum operated unit is totally enclosed and all openings like seed inlet and outlets and stone discharge chute are air sealing type providing a designed, constrained air flow through only the diffuser plate. Carefully shaped hood helps ensure air suction through the working deck and simultaneously discharge air with minimum losses. Large glazed windows are provided on hood to exercise real-time operational control. Sufficient hand-holes are provided in case mesh cleaning is required. Special heavy gauge wire mesh offers long life compared to commercial carbon steel mesh. All controls like air volume, deck inclination, projection angle etc. are easily adjustable and positioned such that operator can exercise real time control over the process while machine is in operation. Destoner mainly finds application in the seed handling industries wherein same size stones have to be removed from seeds before processing. Gram Destoner mainly finds application in the seed handling industries wherein same size stones have to be removed from seeds before processing. Carefully shaped hood helps ensure air suction through the working deck and simultaneously discharge air with minimum losses. 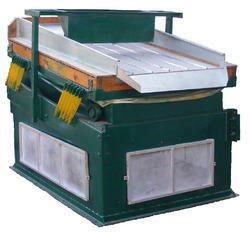 Paddy Destoner mainly finds application in the seed handling industries wherein same size stones have to be removed from seeds before processing.